Thanks to kaplanfx on Flickr for the photo. Welcome to Washington, Firestone Walker! Thanks to the Fullpint.com for the heads up on the press release (see below). I’m not sure if we’ll see their beers on shelves immediately, but I’d highly suggest giving them a try when you see them. Their Union Jack IPA ranks up there with Pliny the Elder (from Russian River) in my opinion. I’ll say it once again: I love living in Seattle . Not only do we get all of the great local beer that doesn’t leave the city/state for the most part, but the best of the best from other states send their beer to us. Looking just at California, we’re now getting beer from what most people would say are three of their best breweries: Lost Abbey/Port Brewing, Russian River and Firestone Walker. Alesmith and the Bruery come to mind as CA breweries we’re still “missing” (I’m not saying the rest aren’t worthy); Alesmith is coming to WA very soon as well I believe, and since the Bruery is in Portland already they might not be too far behind. Firestone Walker Brewing Company announced their expansion into the states of Arizona and Washington today. The brewery is partnering with Hensley Distributing, covering the greater Phoenix and Prescott Valley areas in Arizona and K&L Distributing in Washington covering the Seattle metro area. “We are excited to offer these award-winning pale ales to our consumers,” said Andy McCain, Hensley’s CFO. “Hensley is proud to represent such a distinct line of craft brews from Firestone Walker Brewing Company,” McCain added. DBA, aka Double Barrel Ale, Firestone Walker Brewing Company’s flagship, Pale 31 and Union Jack IPA will all be available beginning in June. Beer lovers in Arizona and Washington can look forward to 22-oz. bottles, six-packs, and a limited draft selection of Firestone Walker’s three pale ales initially. An expanded draft selection will be available later in the summer. DBA is a British style pale ale partially fermented in a union of oak barrels, a traditional, mid 19th century British brewing method used for pale ale. Pale 31 is a classic California style pale ale and Union Jack, gold medal winner this past year at the Great American Beer Festival, is an India Pale Ale loaded with hops. “Our singular goal is to make the world’s best pale ales and we’re always excited to share them with a new market,” said Proprietor David Walker. Established in 1996 on California’s Central Coast, Firestone Walker a regional brewery committed to making the world’s best pale ales, Firestone Walker remains the only American brewery to ferment beer in a union of oak barrels. Firestone Walker Brewing Company was named “Mid-Size Brewing Company of The Year” at the 2007 and 2003 Great American Beer Festivals and “Champion Brewery” for the category of Mid-Size Brewing Company at the 2006 and 2004 World Beer Cups. 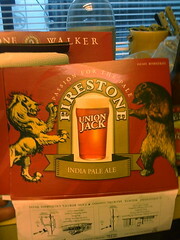 There’s gonna be a CASK of the Firestone Walker Union Jack IPA at Elysian during Seattle Beer Week. Yum! i would add that many east coast cities have had access to some of the california beers we still don’t get, including Alesmith. And any list of beers from CA we need to get must include Green Flash. But those east coast cities don’t get any of our good WA beer:-) You are indeed correct that Green Flash is long overdue. I’ll gladly take a West Coast IPA any time. I think the DBA was solid for sure. It’s just not going to blow you away with hops….but it isn’t meant to; It’s an English style Pale Ale. Sounds like Union Jack should be right up your alley. I have no idea if we’ll be getting their Anniversary beers here in WA, but the two that I’ve tried (“10” and “11”) have been pretty stellar. i am def making that elysian evening. Agree, the east coast misses a bunch, but more and more are creeping across the Miss. I think it is weird that we don’t get a ton of the beers from OR….Term Gravity, HUB, Laurelwood, Heater Allen. Some I understand since they are small, but others?? Went to Beveridge last night and had two beers for the first time–Elliot Bay’s Hop Voorian (?) and Big Al’s Irish Red. Both were excellent. Really good. And my first trip to Bev too. Love it.